On February 24th I went to the oral surgeon for a consultation. 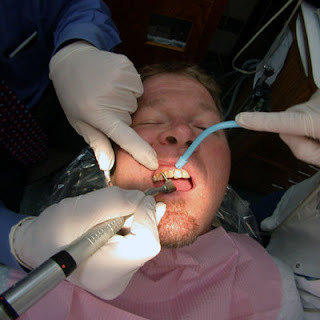 I had to wait to get approval from my dental insurance before I could have the procedure done. Well, today was the big day. I was somewhat anxious since I never had a tooth extracted. I left the apartment at 8:30 AM with Karen for a 9 AM appointment. The dental assistant took my blood pressure just before the surgeon came in. He gave me a local anesthetic. The minor operation took less than 15 minutes as the tooth came out. He prescribed vicodin, a pain killer, which I just didn't need. For a couple of hours I had to keep gauze in my mouth to absorb minor bleeding. Fortunately, the tooth that was removed was in the back. It take a few months at least before the tooth can be replaced by an implant or a bridge. I am glad that it is over. When I got home today Karen showed me a large package that we got from the New York Mets. We opened it up to find the tickets to our 15 game package in a booklet. We also recieve the New York Mets 2009 media guide and a cardboard model of Citifield. The first professional baseball game is this Friday April 3 against the Red Sox while the official opener is Monday April 13 against the San Diego Padres. Our first game is Saturday April 18th agains the Milwaukee Brewers. 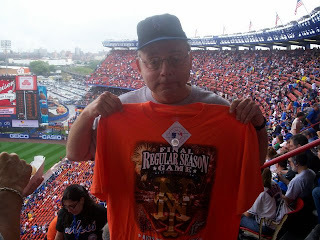 Today Alan Berman, known to readers of this journal as an extremely loyal listener of Saturday Night Oldies, went to the first sporting event at Citifield, a college baseball game between St. Johns and Georgetown. He told me that he also attended the first Met game played at Shea Stadium on April 17, 1964. The photo above was taken at the last game played at Shea on September 28, 2008. Alan tells me that he has tickets for the second game to be played in the new Yankee Stadium on April 17. Alan informs me that he also attended the first Met home game ever April 13, 1962 at the Polo Grounds. I apologize for this omission. Desolation Row - a heavy metal version played during the credits at the end. 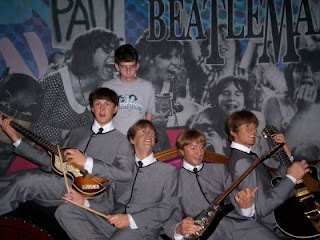 The photo above was taken at Madame Tussaud's Wax Museum in Times Square a few years ago. Today we went to BB Kings right across the street to attend the Beatle's Brunch featuring a tribute band called Strawberry Fields. We met our old friend Roy Herschaft who hadn't seen Lee in about 2 /12 years and wanted to celebrate his 21st birthday with us. The group came out dressed like the moptops of 1964. After the first set the group came out dressed like Sgt. Peppers Lonely Hearts Club Band. They finished the concert by playing songs from 1967-1970. It certainly was not possible for them to play every Beatles song. Lee was disappointed since they didn't sing his favorite "Here Comes the Sun." They also didn't play Birthday from the White album. One thing that is still missing at WCBS-FM is the Harry Harrison birthday book. Every year I would send Lee's birthday to Harry who would announce it during his show. I do not have to talk about Harry's wonderful career to my radio friends who read my journal but for those not familiar with him there is a good Wikipedia article. 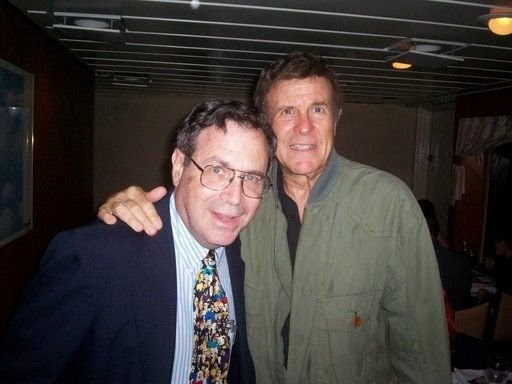 I was disapointed that Harry was not on the WABC cruise in June 2007, but he has been interviewed several times by Mark Simone on SAturday Night Oldies. I certain wish Harry the best of happiness and health in his retirement. Today I opened up an envelope addressed from the Mets and found 3 more tickets. 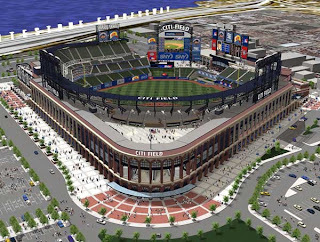 They are opening Citifield on Sunday April 5th for devoted fans like us to see Citifield before the season opens. These are general admission seats to see the Mets work out the day before the 2009 season opens in Cincinnati on Monday April 6. We'll be able to walk around the new ballpark and take pictures. It looks good from the outside as I ride by on the #7 train. At 10 AM this morning the Yankees put single game tickets on sale through the beloved Ticketmaster. I don't know how many tickets per game are being sold without being in a package. Since I am working on the late shift tonight I was home at 10 AM and accessed the site. Since we are going to 15 Met games this season, we decided to go to just one Yankee game to see the new stadium. I got tickets for Saturday afternoon May 2 against the Los Angeles Angels of Anaheim. The seats were in section 405 in the upper deck in right field. Including the Ticketmaster fee the 3 tickets cost $81. On the way home I was standing on the platform on the Times Square subway station waiting for the 3& train to go home. I was reading the City Section of yesterdays New York Times when I found an article about the last standing Jahn's Ice Cream Parlor. This last one is on 37th Avenue and 81st Street in the Jackson Heights section of Queens. 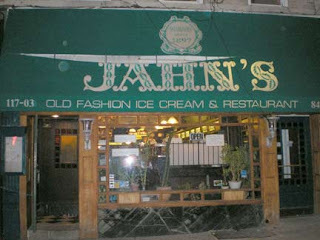 years ago there were many Jahn's in NYC. I best remember the on in Rego Park on Queens Blvd. Back in high school the sidewalk in front of it was a hang out for Forest Hills High School kids. At time we went in for ice cream. If you showed your birth certificate you got a free sundae on your birthday. There was another Jahn's in downtown Flushing just a short walk from Shea Stadium. We would often go there after seeing a Mets game. There are several local newspapers like the Queens Tribune and Queens Tribune which advertise interesting events. It is very expensive to see a Broadway show so it is nice to see a production by a local community group at a much lower cost. Today we went to the Marathon Jewish Community Center in Douglaston to see a production of 42nd Street. The play premiered on Broadway in 1980 and ran for 3500 shows in 9 years. It was based on the 1933 musical film. this production even featured live music. We enjoyed the show. We took a walk over to the local multiplex and saw Knowing staring Nicholas Cage. Again it was a fantasy movie that appeals to younger viewers. It starts out in 1959 when students at a new elementary school put things in a time capsule to be opened in 50 years. In 2009 Nicholas Cage's son opens an envelope with a paper with numbers. It turned out that the numbers predicted disasters that happened after 1959. The Nicholas Cage character then tries to prevent disasters predicted on the paper. I didn't think it was bad, but when I just spoke to my mother, she hated it. A few weeks ago she saw Friday the 13th and walked out in the middle. Very few movies are suited for seniors these days. 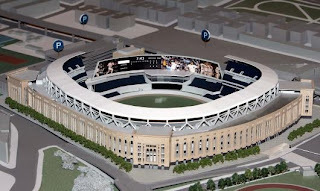 Will I get tickets for the New Yankee Stadium? The only time I root against the Yankees is when they play against the Mets. We usually like to go to one or two Yankee games each season. I just don't know how many tickets will sold on a single game basis. I just lost a lottery to be able to buy single game tickets on Monday March 23. I will have to wait until 10 AM on Tuesday the 24th. If I can't get tickets, I'll have to try Stub Hub. My colleague Heather brought to my attention last week a post in the Gothamist saying that the subway station at Willets Point Blvd would be renamed Mets/Willets Point. Today the new signs went up there. I tip my hat to the MTA for not naming a subway station after a corporation who recieved a bailout from the government. What did I wear to work on St. Patrick's Day? I looked through my entire wardrobe and the only green that I found was this New York Mets cap that I got a few years ago when we went to Irish Night at Shea Stadium. It is now official. 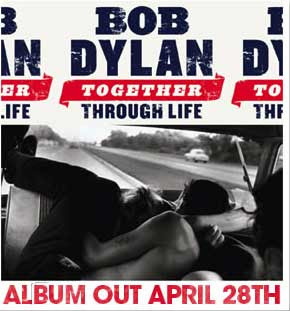 There will be a new CD of new Bob Dylan recordings called Together Through Life on April 28th. It will be a belated birthday present to me. It was announced today on his official web site. He actually was interviewed about the new album by Bill Flanagan. We finally got to see this academy award winning movie. Since it was not playing at our local multiplex we had to take a short drive over to the AMC Loews Bay Terrace Complex, a short 10 minute drive away. Since we are all fans of Who Wants to Be a Millionaire, we enjoyed this film about an 18 year old who won the big prize on the Indian version. There were flashbacks explaining how he knew the answers. There is so much luck involved on the questions that the contestant receives. When I play the computer version, I often can go near the top of the ladder while other times I miss easy questions. I highly recommend it. 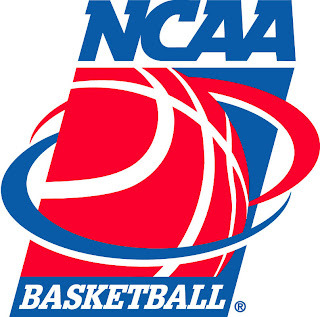 It must be almost impossible to get tickets for the "Big Dance", the NCAA men's basketball tournament. As I've reported in this journal, we have attended many Division II games at CW Post and Queens College. The Eastern bracket of the Division II tournament met today at CW Post. There were 4 games today, so we picked the one at 2:30 PM which was the most convenient for us. Bentley College defeated the University of Bridgeport 79-53. I just read that in the 6 PM game CW Post defeated Philadelphia University 73-51 in a game that began at 6 PM. This morning I recieved a phone call from Ken Hawkins whom I met through the radio club Decalcomania. Ken lives in St. Louis, but in 1999 we had a gathering at his sister's home in Elizabeth, NJ. Ken is a big fan of the St. Louis Cardinals. In January radio enthusiast Victor Monachelli was featured in this journal. He phoned during Saturday Night Oldies to catch up on things. He relocated some years ago to central Florida, but for the past several weeks he has been up in Yonkers helping his parents as they have sold their house there. Back in the mid 1990's I traded radio tapes with David Stein from Cedarhurst, Long Island. Today he reconnected with me on Facebook. At 5 PM today WXRK K-Rock (92.3FM) changed from a hard rock format to a Current Hit format with the moniker 92.3 Now. They are starting out by playing 10,000 songs in a row. In any event neither format was my cup of tea so I am not qualified to make any comments. For years Howard Stern was on 92.3 FM, but his listeners never stayed to listen to the music later in the day. When Stern left for Sirius, the station pick up Opie and Anthony in the morning. The station still floundered so they are now tryng to compete with Z-100 for the kids. I read that the oldK-Rock music is heard on 92.3-HD2. 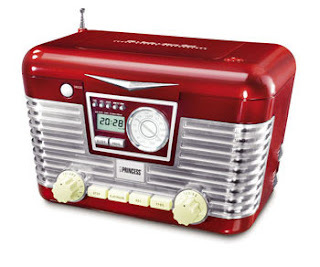 WRXP (101.9 FM) will try to pick up K-rocks listeners. Check the New York Radio Message Board for for comments from the experts. My old friend Herb Hollander finally got a laptop computer after all these years. He had to be the only person on the face of the earth who did not have one. 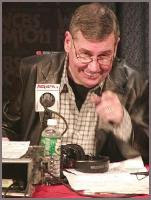 He has to be one of New York's greatest radio enthusiasts. I always had to find him information on the various radio boards. He has to wait a few more days to get Time Warner's Road Runner so he can finally get on the Internet. He just asked me for the address of the New York Radio Message Board. Hopefully, the esteemed moderator will give him posting privileges. Herb will quickly learn the rules of the Information Superhighway when he has his first posting deleted. He will quickly become acquainted with the distinguished members of the virtual community of radio enthusiasts. A Masters degree in the Beatles - What a fantasy! There was an article in yesterday's New York Times Week In Review about Liverpool's Hope University's offering a masters degree in Beatles studies. I would just love to quit my job and pursue this program. No more commuting to Newark! No more information literacy! No more directional questions! 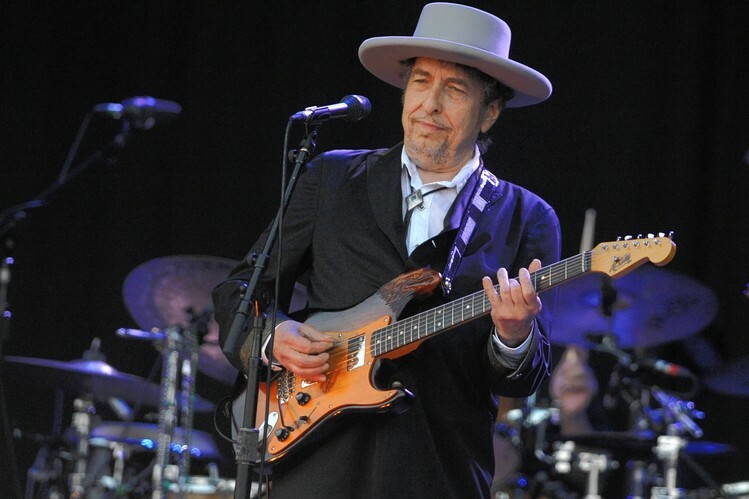 I would write my dissertation on the effect of Bob Dylan on the Fab Four and visa versa. 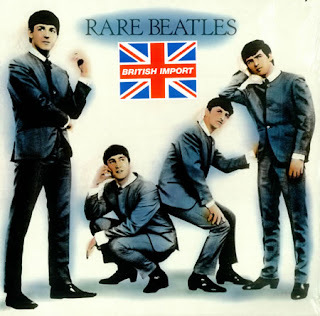 I hope there will be a course on Beatles radio shows. I would be looking forward to hearing some famous guest lectures. 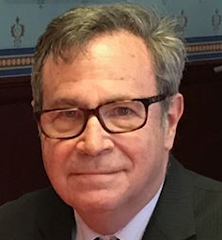 Professor Berman would give a lecture was a detailed statistical analysis of the Beatles' appearances on Saturday Night Oldies. I also hope that the Dean at Hope University will hire Professor Wiener, the Oldies Diva, to entertain the students with her vast knowledge of popular music. She sure can use this job. We took a short walk to Flushing Town Hall again to see Alva Nelso with The Jazz Men from Texas. He had 7 other musicians playing with him this afternoon. It is a shame that only about 50 people were there to see this vibrant band. These programs are support by the Flushing Council on the Arts which gets funding from NYC and NY State. Please see this biography of Alva Nelson. From there we saw the actual Frost/Nixon interviews as we saw the movie version some weeks ago. Nixon insisted that he did not commit any impeachable offenses, but that he just used very poor judgement. From there we saw "Madison Avenue Goes to Washington: The History of Presidential Campaign Advertising." CNN's Jeff Greenfield narrated this documentary which placed the ads in its historical context. I talked about my professional meeting in my other journal today. As we walked from METRO Headquarters to the diner I see WABC radio personality Curtis Sliwa walking down the street by himself. I said "Hello Curtis". He smiled at me as we both walked to our respective destinations. 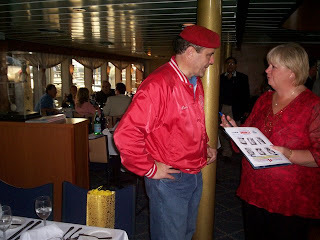 I took the above photo at the WABC Cruise in June 2007 as Curtis was talking to a fan. I listen to talk radio on WABC somewhat irregular, but I think I'll checkout Curtis' show at 10 PM tonight. In the 8th grade Larry brought his tape recorder to school as our friend Joshua taped some classes. Mrs. Klein, the math teacher, went into a rage when he told her that he taped the class. Mr. Cahill, our math teacher, called him Stinky. We then called Larry Stinky Stale. We went to each other Bar Mitzvahs in the Spring of 1962. Larry had had a crush on a girl Bonnie Berkowitz and wanted me to invite her to my party. 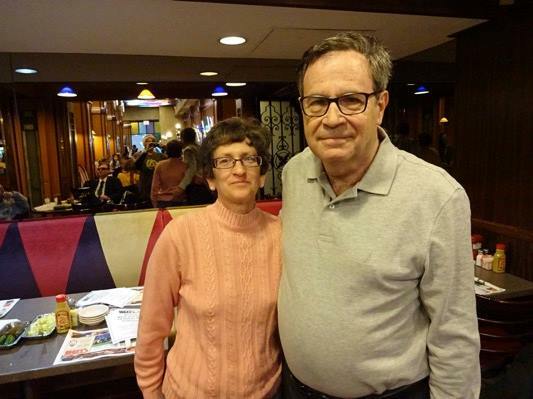 Larry invited our Social Studies teacher Mrs. Minov to his reception and she came. In 1972 Mrs. Minov was a contestant on the quiz show The Who, What or Where Game with Art James. Larry's service was at Temple Israel while his reception was at a catering hall called the Regency in Jamaica, Queens. I remember one day Larry invited me to his house as with listened to the record The First Family with Vaughn Meader. I'll probably remember more anecdotes later. 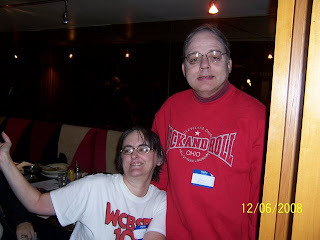 Larry spread a story that I was madly in love with this real ugly girl named Monica. At about 12 noon I felt well enough to take a short walk over to the local McDonalds for lunch. I spent time watching television, reading, listening to the radio and surfing the web. Back to work tomorrow. MARCH 13-14, 1993: This blizzard resulted in four deaths and more than $19 million in damage on the Island with winds that reached more than 70 miles per hour. During the storm 152,000 people lost electrical power. MARCH 3-5, 1960: This storm brought 17.3 inches of snow, a local record for a March storm. MARCH 8, 2005: Heavy winds turned a middling snowfall of 4 inches into an adventure on the Long Island Expressway, where drivers experienced whiteout conditions. State Department of Transportation plows attempted to clear roads just before rush hour and were blocked by traffic, causing major delays. Suffolk police reported 54 accidents between 4 and 5 p.m.
MARCH 16, 2004: A late nor'easter dropped 4 inches of snow on Long Island, capping a week that had seen temperatures in the 50s. MARCH 1967: More than 31 inches of snow fell for the entire month, setting a local record that still stands. MARCH 21-22, 1966: 16 inches of snow fell on Long Island, one of the highest totals ever for the month. 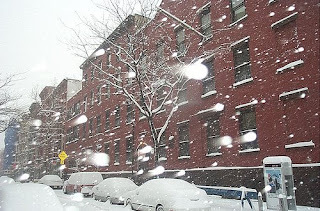 NYC got 8 inches of snow yesterday, but it was only 12 degrees this morning which is especially cold for early March. I usually work on Thursday nights, but this week I switched with Heather so Tuesday is my late day. I can't sleep later in the mornings, but when I am scheduled to arrive at 1 PM, I don't have to confront crowded subways. Every day, I read about more and more layoffs in this miserable economy. One has to be grateful to have a job these days. I have had more than my share of frustrations at work, but the worst thing has to be pounding the pavement looking for a job while unemployed. The summer of 1982 was the last time I was unemployed. I still remember that terrible feeling. I got the call at about 10:00 last night that NJIT is closed due to a snowstorm. This is the first time this year that we were closed for weather. We had several small snowstorms, but this year we got the biggest storm in March. The snow usually melts quickly when it comes this late in the season. For the first time in 5 years the New York City School system was closed so Lee has the day off as well. 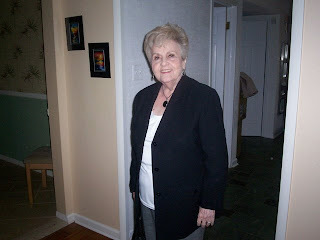 This is a photo of my mom, Lillian Slutsky. She actually was questioned about her age when she tried to buy a senior citizen ticket for the movies. She walked out of Friday the 13th. I don't blame her since the movie was excessively violent. Anyway, may she stay Forever Young.